Purnea (Bihar), Aug 26 (IANS) Prime Minister Narendra Modi on Saturday announced a Rs 500 crore relief package for Bihar after conducting an aerial survey of the flood-hit regions in the state. “Announced a package of Rs 500 crore for Bihar,” the Prime Minister’s Office tweeted. Modi assured “all assistance” to Bihar Chief Minister Nitish Kumar. He also announced an ex-gratia of Rs two lakh to the kin of the victims and Rs 50,000 for those injured during the floods. “A central team would be sent to Bihar to access the losses due to the floods,” he said. Modi along with Nitish Kumar and his deputy Sushil Kumar Modi, conducted the survey of Kishanganj, Purnea, Katihar and Araria districts of Seemanchal region — the worst hit. 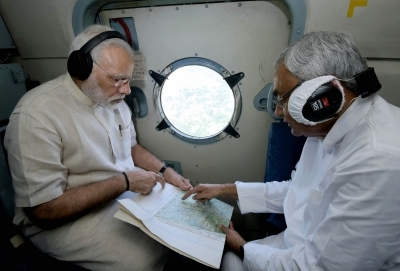 The aerial survey took nearly 50 minutes as the leaders took stock of the situation, an official of the Bihar disaster management department said. Following the survey, Modi met top central and state officials along with Nitish Kumar and Sushil Modi, at the conference hall of Chunapur airport in Purnea to review aid management. Earlier, Modi was received by Nitish Kumar and Sushil Kumar Modi at the Purnea airport. The death toll due to floods in Bihar stands at 418 in 19 districts.